Front Binding – As this is a Connecticut reprint, I must say this is one of their better boards (although, as usual, the New York original is superior) for a Macy era title. 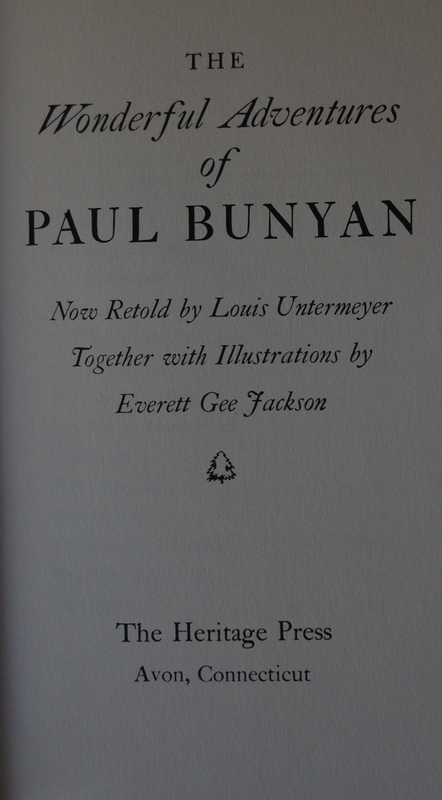 Anyway, the folk tale of Paul Bunyan is one of the few children’s titles printed as a solo Limited Editions Club edition: the fairy tales of Andersen and the Brothers Grimm, Robert Louis Stevenson’s A Child’s Garden of Verses, Aesop’s Fables and the special Evergreen Tales sets of tales are some others. However, this retelling of the American classic is fairly special in that Louis Untermeyer, a common ally of the George Macy Company, had his rendition of the tale specifically printed, making it his sole credit as the author of a work for Macy. Untermeyer would otherwise serve as translator (Cyrano de Bergerac‘s second printing), editor (the second set of Grimm’s Fairy Tales) or introducing a work (The Innocent Voyage) for many projects in the Macy sphere. Everett Gee Jackson began his career for Macy here, and would go on to render five other books for the Limited Editions Club: The Ugly Duckling for a set of Evergreen Tales in 1949, Popoh Vuh: The Book of the People in 1954, 1957’s The History of the Conquest of Peru by William Hickling Prescott, Helen Hunt Jackson’s Ramona in 1959 and his last, a collection of American Indian Legends published in 1968. 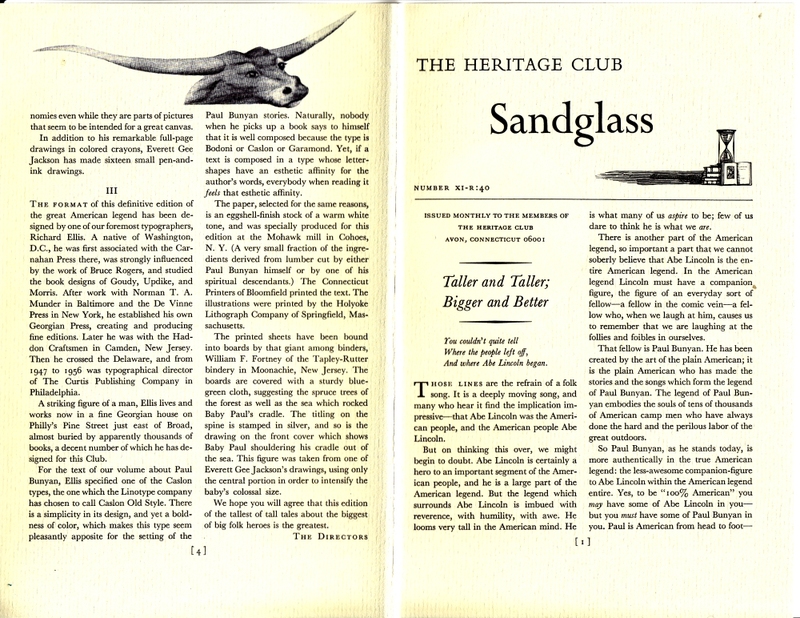 Title Page – Untermeyer and Jackson both get a half page or so in the Sandglass, so I’ll let that do the talking for me. What I will speak of is the design info: The original Heritage printing was designed by Richard Ellis. 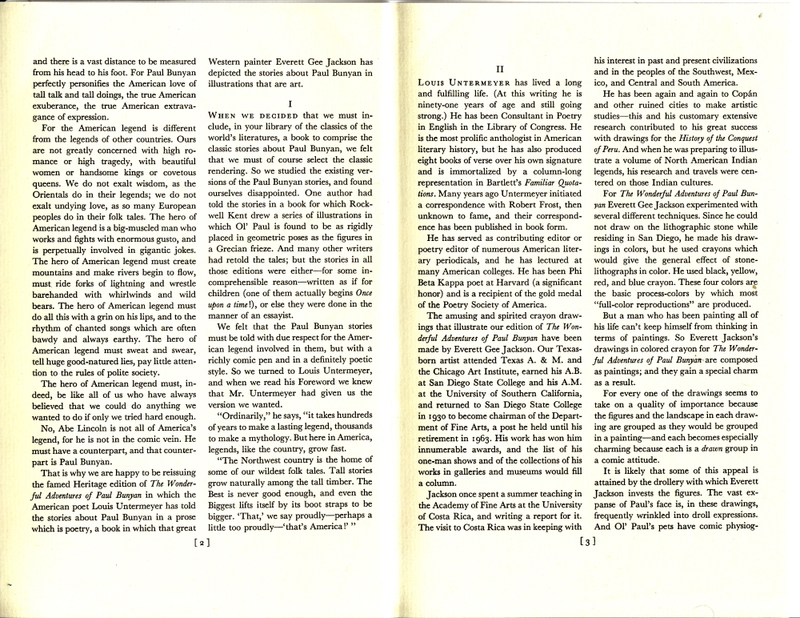 William F. Fortney of Tapley-Rutter bound the book, the Caslon Old Style text was printed on Mohawk paper by Connecticut Printers, while Jackson’s pictures were redone by Holyoke Lithograph Company of Springfield, Massachusetts. 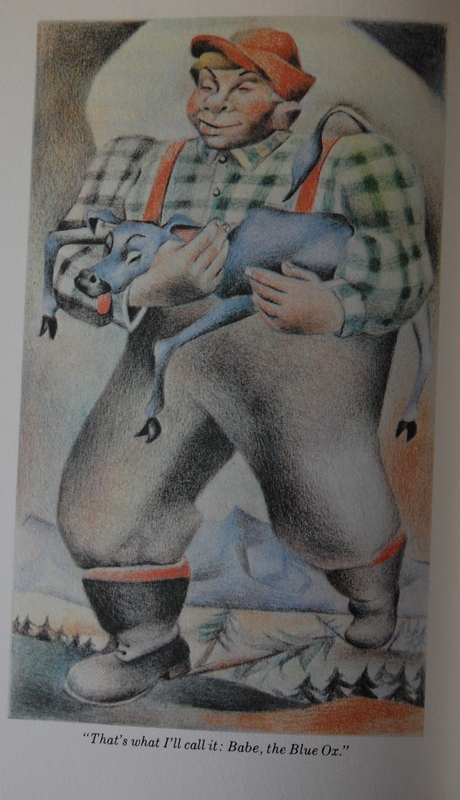 Page 8 – …as well as these colored illustrations. These were done in crayon, but printed to resemble paintings. 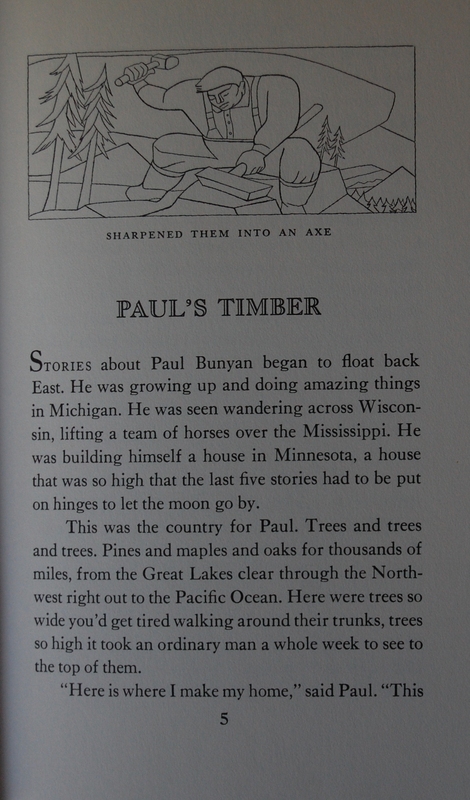 An appropriate choice in materials, given Bunyan’s folk tale status for children. Jackson’s style works with the lore, but it’s not really my thing. 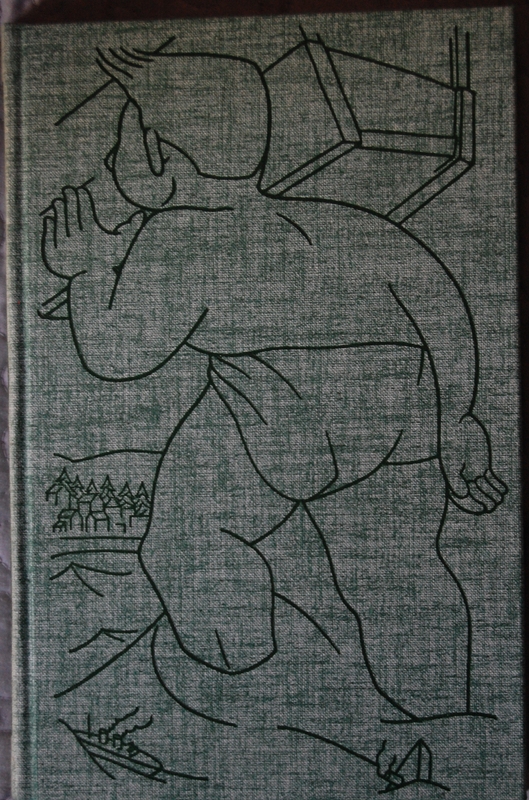 Personal Notes – I got this rather cheaply from Windows on the World – Books & Art, my former bookselling appointment, but I didn’t realize until I got home it was a Connecticut edition. 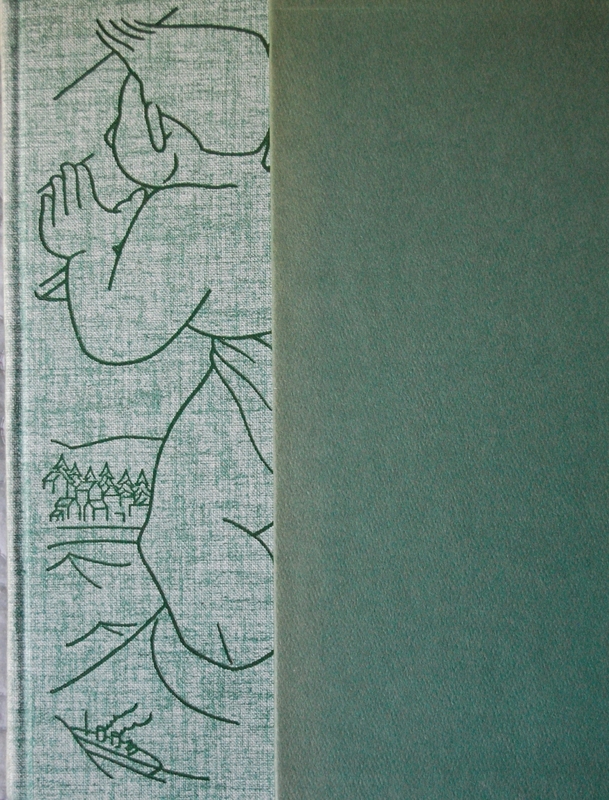 Still, I was able to document it before it was sold off to get other Heritage Press books this year. 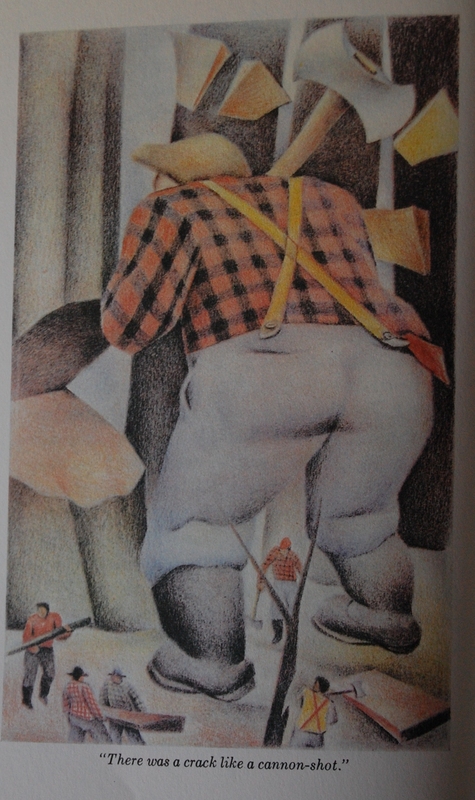 You are currently reading Heritage Press – The Wonderful Adventures of Paul Bunyan, retold by Louis Untermeyer (1973, Connecticut) at The George Macy Imagery.